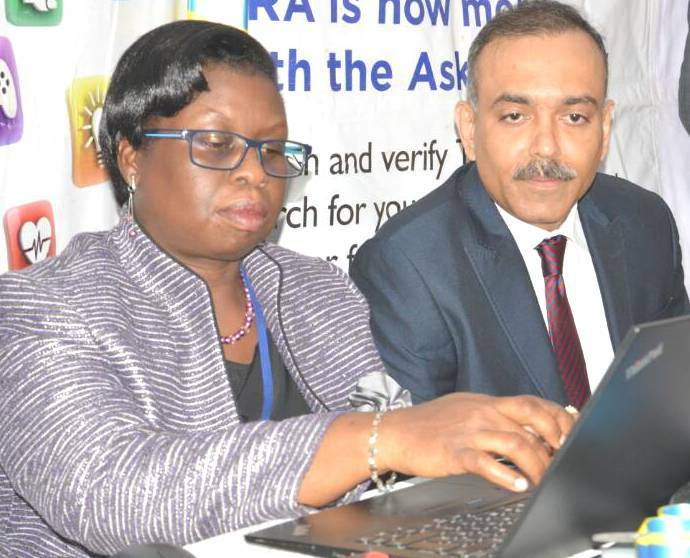 Doris Akol, the Uganda Revenue Authority Commissioner General and Rakesh Jha try out an online option to pay taxes through Barclays Bank Uganda earlier this year. July 26, 2018—Uganda’s online service index has improved from 50 pc in 2016 to 57 pc in 2018, according to the latest United Nations E-Government survey, which puts the country in the favourable high online service index bracket. Denmark, Australia and South Korea top the world rankings. James Saaka, the Executive Director at the National Information Technology Authority- Uganda (NITA-U) said the ranking is a direct result of the government’s deliberate efforts to automate the majority of its systems. This is to ensure citizens can access government services more efficiently. “Through technical support from NITA-U, under the Ministry of ICT and National Guidance, a number of Ministries, Departments and Agencies (MDAs) have taken services online. This has resulted into the automation of processes and development of services which are already improving efficiency and transparency,” he said. With a grading of High e-Participation on the index, Uganda was lauded for the improvement in this score as it showcases Uganda’s commitment in implementing further tools for engaging citizens. According to the survey, the three most commonly used online services in 2018 are utilities payment, submission of income taxes, and registration of new businesses. The survey is the only global report that assesses the e-Government development status of all UN member states. It measures e-Government effectiveness in the delivery of public services and identifies patterns in e-government development and performance. Results are tabulated and presented as a set of standardized index values on a scale. Uganda’s e-Government development index (EGDI) also improved from 36 pc in 2016 to 41% in 2018, which is above the African average of 34 pc. Citizens can access the above services by visiting, http://ecitizen.go.ug/. What’s even more exciting is that access to the portal is free of charge when one is using free WiFi, MyUG that is accessible across 284 locations in Kampala and Entebbe. As a good example, Kahiigi spoke of the e-visa platform which allows foreigners to apply for visas of all classes, visa renewal and insurance, residence permits application/renewal and issuance, work permits /entry permits, passes (student pass, dependent passes and special passes) and certificates of residence. By the end of 2017, more than 212,000 applications and application time reduced from one month to five working days.